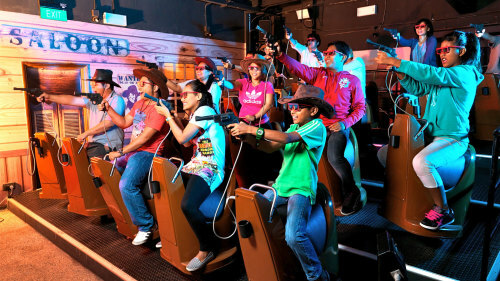 Experience thrilling 4 D motion simulated ride in Cineblast. It is a virtual roller coast with a large screen projection. Sitting at one place you can experience the excitement of sitting on a mountain peak virtually or getting deep into a valley. The 4D Msgix offers interactive movie experience with 4D effect. Sitting on your seat and wearing the 3D glasses, you can feel heavy wind blowing on your face or high waves rushing over your body. All these are possible virtually.